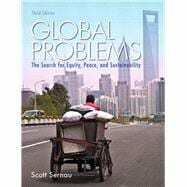 Scott Sernau (Ph.D., Cornell University) is Professor of Sociology and Director of International Programs at Indiana University South Bend where he regularly teaches courses on social inequality, urban society, sustainability and global issues. He has taught in Mexico, in France and aboard ship on global voyages with the University of Virginia’s Semester at Sea program. He is the author of Economies of Exclusion: Underclass Poverty and Labor Market Change in Mexico; Critical Choices: Applying Sociological Insight in Your Life, Family, and Community; Bound: Living in the Globalized World, and Social Inequalities in a Global Age as well as editor of Contemporary Readings in Globalization. He has won six trustee’s teaching awards, as well as the Sylvia Bowman Award for Distinguished Teaching and the PA Mack Award for Distinguished Service to Teaching. He serves on the steering committee of the IU Faculty Colloquium on Excellence in Teaching, the board of the IUSB Center for a Sustainable Future, and the board of the Toda Institute for Global Peace and Policy Research. Chapter 11: Technology and Energy: Prometheus’s Fire or Pandora’s Box? Chapter 12: Ecology: How Much Can One Planet Take? And Who Will Care for the Children?